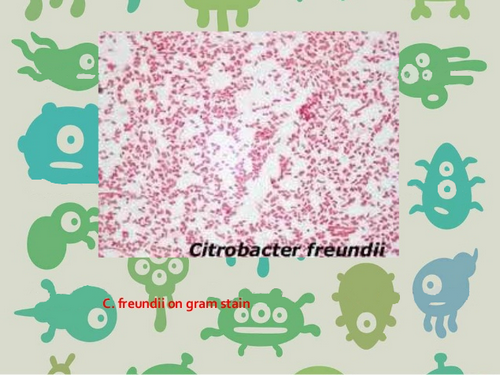 Citrobacter freundii, are aerobic gram-negative bacilli. They are long, about 1-5 μm in length and are rod-shaped. A few of them are non-motile, but most of them move using their flagella. They contain two membranes, both the inner and outer. The space in between the two membranes is called periplasmic space. Citrobacter freundii characteristics are described as opportunistic. They cause a number of infections. In fact, they are the one responsible for infections of the urinary tract, respiratory tract, and blood infections, to name a few. About 29% of opportunistic infection is caused by Citrobacter freundii. Citrobacter freundii have the ability to grow on glycerol. They can also metabolize lactose or citrate. On the positive note, Citrobacter freundii have a beneficial role in the environment. They reduce nitrate to nitrite in the environment, which plays an important part in the nitrogen cycle. 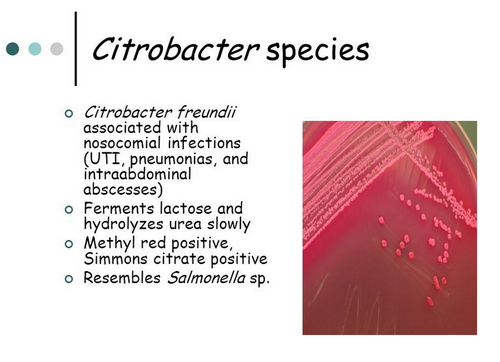 Citrobacter freundii being an opportunistic microbe can cause severe infections. However, it can only affect humans with weak immune system or those immune compromised. If you are healthy, you are less likely to get infected by this microbe. Citrobacter freundii is associated with neonatal meningitis. What is meningitis? It is the inflammation of the meninges (the covering of the brain). Citrobacter freundii can cross the blood-brain barrier. It can reside in the brain and even replicate too. Citrobacter freundii treatment using antibiotics is modified because some strain of citrobacter freundii developed resistance to a certain number of antibiotics. To hasten the healing process, supportive treatment is given to the patient along with tested and proven effective antibiotic of choice. During the course of treatment, it is important to be open to your health care provider. If you have any allergy to antibiotics, you should inform your physician right away to prevent adverse reactions. Antibiotics offer a quick relief from the symptoms that are currently bothering you. Even so, you should continue taking the antibiotics until your doctor tells you to stop. This is to prevent recurring infection. If you are experiencing any side effects, you should inform your doctor right away. This is to avoid another infection and prevent worsening of your condition. If you are suffering from severe Citrobacter freundii infection, the antibiotic is given to you via intravenous route every eight hours until you no longer have fever. This typically lasts for three days. After that, you can take oral antibiotics. Citrobacter freundii infection has a moderate prognosis. It is important to treat the infection right away. Neglected cases of Citrobacter freundii infection could lead to severely poor prognosis. If the infection is left untreated, the patient could die. If you are suffering from urinary tract infection secondary to Citrobacter freundii infection, the prognosis is good. However, the prognosis is moderate to poor in patients with peritonitis (inflammation of the lining of the abdomen). In the case of people with meningitis caused by Citrobacter freundii infection, the prognosis is poor. In fact, the death rate ranges from 25% to 50%.